Have you not yet joined in to support Dungeon Fantasy Monsters 2 and the reprint of the Dungeon Fantasy Roleplaying Game (now on Kickstarter)? 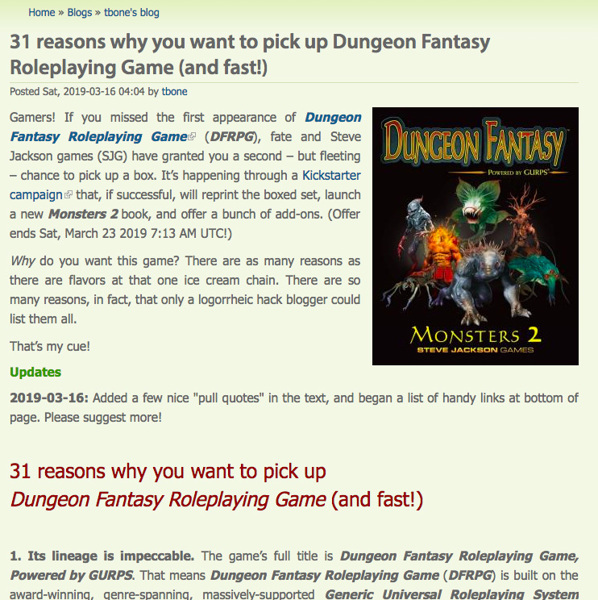 The campaign closes this Friday, and forum user tbone*has written "31 reasons why you want to pick up Dungeon Fantasy Roleplaying Game (and fast!)" at his blog, and this is a spectacular showing of support for the project that we just had to share with you. The game's design, presentation, flexibility, and lineage are all included in the "31 reasons" listing, and we can only say: Thank you! This was clearly a lot of work to assemble, and we're always humbled when players share such detailed, well-considered articles about our games. Check out the article here, and then be sure to back Dungeon Fantasy Monsters 2 before it is too late and the campaign comes to a close. For your Ogre games! Unload on your opponents with Bullet Dice! These custom, double-injected dice accurately resemble a bullet and cartridge, and can replace any standard six-sided dice. Bullet Dice are the ideal ammunition for a great game night! Order now on Warehouse 23!